WHY ARE YOU LEARNING ENGLISH? TO GET A BETTER JOB, TO PASS AN OFFICIAL ENGLISH EXAM, TO TRAVEL, OR JUST TO COMMUNICATE IN ENGLISH? 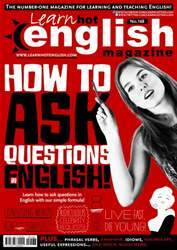 LEARN HOT ENGLISH MAGAZINE HELPS WITH ALL THIS. 1 Increase your vocabulary. In every issue of Learn Hot English you’ll learn over 350 English words and expressions! Plus you’ll learn lots of idioms, phrasal verbs, grammar and more.